In Part-1 we had featured the soundtracks that made it to the bottom of the list (76 to 100). So, let’s continue with our countdown from 75 to 51. Milan won the Best Music award in 1967, and one can say that it deserve that award as its music are superb, and it can easily be ranked as Laxmikant-Pyarelal best album in the 60s. From the lovable Hum Tum Yug Yug Se, to the evergreen Sawan Ka Mahina, to the great Bol Gori Bol Tera Kaun Piya, to the mesmerizing Main To Diwana, to the lovable Tohe Sanwariya, to the soulful Ram Kare Aisa Ho Jaye and the hit Aaj Dil Pe Koi Zor, Milan was truly a masterpiece album from Laxmikant-Pyarelal that appeals to everyone, which is why it’s still popular till this date. 1969 was the year that made Rajesh Khanna a superstar in Bollywood. Right after the blockbuster Aradhana, came another blockbuster for Rajesh Khanna and that was Do Raaste. Not only was the movie a super success, the music was a huge hit in those days. Bindiya Chamke Gi was the signature tune for this movie, which became an instant chartbuster song at that time. Definitely, this track is still a classic till this date. The other Hit songs in this album were Yeh Reshmi Zulfen, Mere Baseeb Mein Aaye Dost, Dil Ne Dil Ko Pukara, Apni Apni Biwi and the title track. Do Raaste was among the top selling album in the 1960s, and going by how big the songs were in those days, it comes to no surprise. Nadeem-Shravan always provides great music to the Darshan, and Dhadkan is simply one of its best albums. The movie manages to reach the safety mark at the box-office, and one reason that attribute to Dhadkan success is its super-hit music. From the sweet and upbeat Dil Ne Yeh Kaha Hai Dil Se, to the mesmerizing Tum Dil Ki Dhadkan Mein, to the superb Dulhe Ka Shera Suhana Lagta Hai, and the fun Na Na Karte Pyar, Nadeem-Shravan were still able to recreate their magic 10 years later with Dhadkan. As always, Yash Chopra soundtracks always tend to give superb soundtracks. There is something special about Chandni that still makes it a classic soundtrack till this date. From the classic Mere Hathon Mein Nau Nau, to the lovable Chandni O Meri Chandni, to the romantic Mitwa, to the soulful Lagi Aaj Sawan Ki, to the wonderful Parbat Se Kali Ghata, to the brilliant Aa Meri Jaan and the exciting Mehbooba, Chandni was definitely a masterpiece in its own right, and it comes to no surprise that Chandni was one of the top selling albums in the 80s. Dil Chahta Hai is probably Shankar-Ehsaan-Loy best album till date. What made Dil Chahta Hai album special at that time was that it was an experimental album and it worked a huge way. From the superb title track, to the chartbuster Jaane Kyon, to the wonderful Who Ladki Hai Kahan, to the soulful Kaise Hai Yeh Rut, to the amazing Koi Kahe Kehta Rahe and the breathtaking Tanhayee, Shankar-Ehsaan-Loy brought an American feel to this album and it manage to succeed in entertaining the audiences. It’s a shame we don’t get albums like Dil Chahta Hai these days. Winner of the Best Music award in 2000, this is the movie that started the Hrithik Roshan wave. What made Kaho Naa Pyar Hai special, well; two prime examples are Naa Tum Jaano Na Hum and Ek Pal Ka Jeena, which for both songs mark the debut of singer Lucky Ali. These songs ruled the charts at that time, and made Lucky Ali an instant star and bagged awards for both songs. The other Hit tracks for these albums were the title track, Pyaar Ki Kashti Mein, Dil Ne Dil Ko Pukara, and Chand Sitare. Overall, Rajesh Roshan came up with an album that is great, and is still popular till this date. This is the movie that made Rani Mukherjee and Karan Johar overnight stars. Although stars like Salman Khan, Shahrukh Khan and Kajol were already stars, Rani Mukherjee and Karan Johar truly benefit from this blockbuster. And one aspect that made Kuch Kuch Hota Hai was its super-hit music. From the title song, to Saajanji Ghar Aaye, to Koi Mil Gaya, to Yeh Ladka Hai Deewana, to Tujhe Yaad Na Meri Aaye and Ladki Badi Anjani Hai, each of these songs were huge hits with the audience that made it the top selling album of 1998. One of the best romantic albums in the 90s. Aap Ki Kasam has unforgettable tunes from RD Burman. This album was definitely not only one of the best albums in the 70s, but one of the best albums from RD Burman. RD Burman came up some great songs that are still popular till this date. Who can forget one of the best romantic duets ever in Bollywood history Karvaten Badalte Rahe, which is ranked amongst RD Burman best songs. Also, the evergreen Jai Jai Shiv Shankar, which is still popular till this date. Well, those two songs are the best songs in Aap Ki Kasam, however Aap Ki Kasam has other Hit tracks, which makes this album very popular. Zindagi Ek Safar, Suno Kaho Suno Kaha, Chori Chori Chupke Chupke, and Paas Nahin Aana were extremely popular in those days. Aap Ki Kasam is definitely a must have album for everyone. When it comes to an Abbas-Mustan film, it always has good music and that’s thanks to Anu Malik. Winner of the Best Music award in 1993, Baazigaar is definitely Abbas-Mustan-Anu Malik best album till date. From the excelling title track, to the splendid Ae Mere Humsafar (the best song in this album), to the chartbuster Yeh Kaali Kaali Aankhen, to the romantic Samajh Kar Chand, to the wonderful Chuppa Na Bhi Nahin Aata, to the passable Kitaben Bahut Se, the success of Baazigaar album relied on main thing, great melody. For Shahrukh Khan fans, this is an album that one should have, as it was Baazigaar that made him the true star that he is today. Guru Dutt, like Raj Kapoor and Yash Chopra, always has an ear for good music. That’s what make Kaagaz Ke Phool album so amazing, that there is so many songs that are worth hitting the rewind button. Waqt Ne Kiya is probably one of the best songs ever in Bollywood as it’s very soulful and has beautiful rendition from Geeta Dutt. The other Hit songs from this album are Dekhi Zamane Ki Yaari, Ek Do Teen, Hum Tum Jis Kahta Hai, San San San Woh Chali Hawa, and Ulte Sidhe Dao Lagaye. Kaagaz Ke Phool is ranked Guru Dutt’s finest album till date, and one of the best albums in the 50s. Ek Do Teen became a rage back then, and still is, which is what makes Tezaab album so memorable. Once again, Laxmikant-Pyarelal came up with another super-hit album that is ranked one of the best albums ever in the 80s. Ek Do Teen has to be ranked as one of the top ten popular songs ever in Bollywood. This song became a huge rage all over in the world, and it can easily be ranked as Madhuri Dixit best song till date. The other superb songs were Keh Do Ke Tum Ho Meri Varna, and So Gaya Yeh Jahan. The music ended up becoming one of the biggest assets in this cult classic, and yet Ek Do Teen is still popular till this day. That’s what makes Tezaab so memorable. This album was definitely aimed for the masses, as it became the most awaited album of 2001. And yet, it didn’t disappoint, which made Kabhi Khushi Kabhie Gham the highest selling album of 2001. Karan Johar gave us superb music in Kuch Kuch Hota Hai, however, Kabhi Khushi Kabhie Gham is a slight better than Kuch Kuch Hota Hai as it offers a better variety of songs. From the amazing title track, to the wonderful Bole Chudiyan, to the youthful You Are My Sonia, to the soulful Suraj Hua Maddham, to the energetic Say Shava Shava, to the patriotic Vande Mataram, and wonderful Yeh Ladki Hai Allah, K3G is an astonishing album that easily appeals to everyone. Karan Johar definitely scored with this album. Probably one of the most underrated albums ever in Bollywood history has to be Phir Teri Kahani Yaad Ayee. Phir Teri Kahani Yaad Ayee is the perfect example of a classic album that went unnoticed throughout the years. Today, Phir Teri Kahani Yaad Ayee is considered to be a masterpiece from Anu Malik. Who can forget the heartfelt Tere Dar Par Sanam Chale Aaye, to the heartbroken Dil Deta Hai Ro Ro Dohai, to the superb Shairana Si Hai Zindagi, to the perfect love duet Dil Mein Sanam Ki Soorat, to the sweet Badalon Mein Chhup Raha Chand and the above average Aane Wala Kal Ek Sapna. The Bhatts always have a great taste of music, and Phir Teri Kahani Yaad Ayee is not only an achievement for the Bhatts, but for Anu Malik for coming up with some timeless tunes. It’s a shame that Phir Teri Kahani Yaad Ayee wasn’t nominated for any music awards. It was definitely the best score of 1993. Winner of the Best Music award in 1995, Rangeela had excellent music from A.R. Rehman, which made him an instant star. To the superb Rangeela Re, to the wonderful Hai Rama, to the beautiful Kya Kare Kya Na Kare, to the brilliant Pyar Ye Jaane Kaise, to the magnificent Tanha Tanha (easily the best song in the album), while the others songs like Yaaron Sun Lo Zaara and Mangta Hai Kya is unique in its own way. Definitely Rangeela is an album that caught with the masses very easily, and you can see why with the splendid music by AR Rehman. Manoj Kumar films back in the 60s through the 80s always had great music. Kranti is no exception as it was one of the top selling albums in the 80s, and the songs are still adored till this date. The best thing about Laxmikant-Pyarelal albums is that they have that one main thing that music lacks today, MELODY. To the soulful Zindagi Ki Na Toote, which is still being adored till this date, to the fun Maara Thumka, to the energetic Lou Shama Se, to the great Ab Ke Baras, to the wonderful Durga Hain Meri Maa, to the patriotic Kranti Kranti and the superb Chana Jor Garam, Kranti is definitely one of the best soundtracks of the yesteryears, and a must have for every generation who appreciate good melody. Anu Malik tends to give okay album these days to certain directors, however, if there is one director that Anu Malik save his best for, its definitely JP Dutta. All five songs from Border are top-notch songs, though it is patriotic, but one doesn’t seem to get sick of it. Some of the Super-Hit tracks include the semi-classic Hamen Jab Se Mohabbat, the wonderful Ke Ghar Kab, the soulful To Chalun, the patriotic Hindustan Hindustan, and the heart-rending Mere Dushman Mere Bhai. It definitely comes to no shock that Border is considered to be one of Anu Malik best album till date and one of the best soundtracks in the 1990s. Once again, a Subhash Ghai film soundtrack has made it into the list. Well, it comes to no surprise that Ram Lakhan is in the list as it has an excellent score from Laxmikant-Pyarelal. Once again, melody is the key component in the album, which made the album popular till this date. Songs like Bada Dukh Dina O Ramji, My Name Is Lakhan, Tera Naam Liya, Mere Do Anmol Ratan, Main Hoon Hero weren’t not only Hit composition those days, however these songs are still popular to this day. Once again, another achievement from the Laxmikant-Pyarelal – Subhash Ghai team. Winner of the National Award for the prestigious Best Music award in 2000, Refugee was definitely the best album in 2000. Each and every song in Refugee is inspiring that will be loved by the audiences instantly. From the classic Panchhi Nadiyan, to the elegant love duet Aisa Lagta Hai, to the haunting Raat Ki Hatheli Par, to the qawaali Jise Tu Na Mila, to the lovely Taal Pe Jab and the semi-classic Mere Humsafar, Refugee is definitely an album for everyone as full credit goes to Anu Malik for giving an album that leaves an mark. Also a special mention must be given to Javed Akthar for writing some thoughtful lyrics. The music in Manoj Kumar films was always special in those times. Upkaar was a huge achievement for Manoj Kumar, and it ended up being the top selling album in 1967 thanks to its evergreen songs. Manoj Kumar was one filmmaker who believed that music was always part of the story. Mere Desh Ki Dharti is perhaps the best patriotic song ever in Bollywood as it’s still popular till this date. It won singer Mahendra Kapoor and lyricist Gulshan Bawra awards. The other Hits in this album were the evergreen Kasme Vaade, to the wonderful Har Khushi Ho Wahaan, to the superb Deewano Se Yeh Mat Pooncho, the fun Aayi Jhoomke Basant and the unforgettable Gulabi Raat Gulabi. The music of Upkar was as big as the film, and Upkaar music remains an achievement in Bollywood. If there was any music directors that ruled the 90s era, it was definitely Nadeem-Shravan. At that time, Nadeem-Shravan was dishing out memorable albums, one right after the other. This is why Raja Hindustani is still one of the most popular albums till date by Nadeem-Shravan, and became one of the top selling albums in the 90s. From the chartbuster Pardesi Pardesi, to the beautifully Puchho Zara Puccho, to the outstanding Aaye Ho Meri Zindagi, to the romantic Kitna Pyara Tujhe, and the wonderful Tere Ishq Main Nachenge, Raja Hindustani emerged as not only top selling album in 1996, but it also won the Best Music award. Welcome to the Disco 80s era. Qurbani was probably the first movies to release in the 80s, and the first album in the 80s that became an instant rage with the audience. It ended up being the highest selling soundtrack of that year. Every song from Qurbani (Aap Jaisa Koi, Hum Tumhein Chahte Hain, Laila O Laila, Kya Dekhte Ho, and Qurbani Qurbani) became a rage not only in India, but everywhere thanks to its youthful appeal. Qurbani is an album that you enjoy again and again. If there is anything one can remember from Caravan album, it’s “Monica, Oh My Darling”. Caravan is definitely ranked as one of RD Burman best album, some even considered being RD Burman best, and why shouldn’t be? Caravan’s is simply one of the best musical albums ever in Bollywood. Burman always creates a memorable tune in a Nasir Husain film, and that song is the evergreen Piya Tu Ab To Aaja. It became a huge rage at that time. The other memorable tunes that are still popular to this day are Chadti Jawani Mere Chal Mastani, Kitna Pyara Waada, Dilbar Dilbar Jaani and Goriyan Kahan Tera Desh. The other Hit tracks that were Hum To Hain Rahi Pyar Ke, and Ab Jo Mile Hain. No doubt, Caravan was a huge accomplishment from RD Burman, which is why Caravan album still remains an evergreen album after 35 years. One of Rajiv Rai strengths in all of his films are his foot-tapping music. One can say that Tridev was probably his best album to date. Every song from Tridev was not only foot-tapping, but was a blockbuster. From the chartbuster Tirchi Topiwale, to the romantic Main Teri Mohabbat Mein, to the wonderful Gali Gali Mein, to the superb Gazar Ne Kiya Hai Ishara, the brilliant Raat Bhar Jaam Se and the chilling title song, every song from Tridev was unique in its own way. No wonder why Tridev is Rajiv Rai best album till date. Naushad always tend to give great music to a Dilip Kumar film. And Ram Aur Shyam music is no exception. It comes to no surprise that most of the songs from Ram Aur Shyam are still popular till date. Aaj Ki Raat Mere is still endured to this day thanks to its wonderful lyrics and superb composition by Naushad. The other Hit tracks that are popular in those times were Aayee Hain Baharen, Dheere Dheere Bol, Main Hoon Saqi, and O Balaam Tere Pyar Ki. This album is ranked amongst Naushad best album till date. Sadak is easily one of Nadeem-Shravan best album till date. This album released when Nadeem-Shravan became very popular after the blockbuster album Aashiqui. One of their best compositions till date is Hum Tere Bin, which is easily the best song in the album. 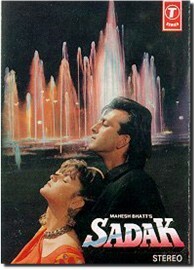 The other Hit songs from Sadak were Jab Jab Pyar, Tumhe Apana Bana (quite popular in those days), Kya Sochta Ae Dil, Zamane Ke Dekhe, and Mohabbat Ki Hai Tumhare Liye. The other two compositions were average tracks. One can honestly say that after Aashiqui, the best Bhatt-Nadeem Shravan album was easily Sadak.